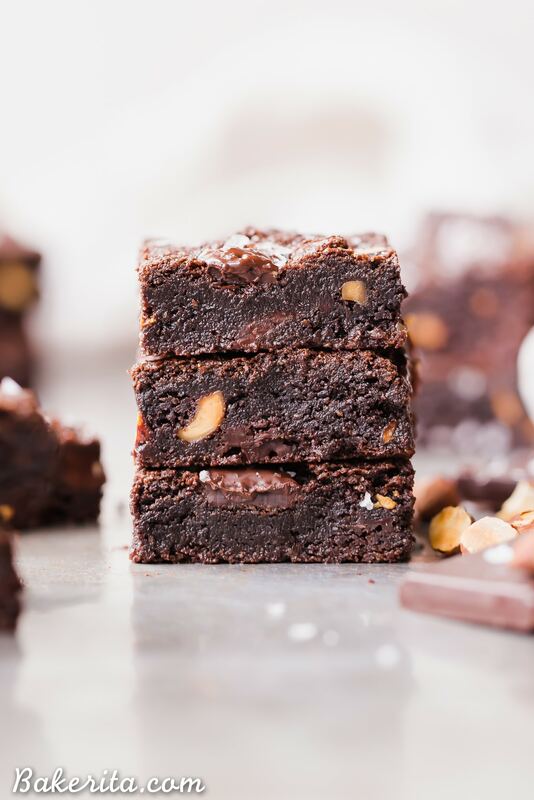 You’d never guess these super fudgy Salted Almond Brownies are gluten-free, paleo and vegan, because they taste just as good as a traditional brownie! 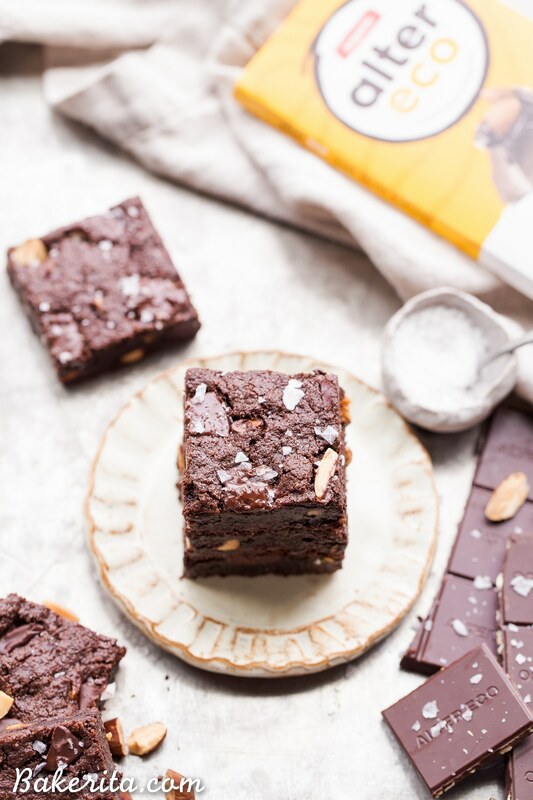 They’re incredibly fudgy and chocolatey and the toasted almonds and sea salt make them even better. This post is sponsored by Alter Eco. I can barely contain my excitement about this post because these brownies have been a longggg time coming. I’ve been working on a vegan brownie recipe (that’s also paleo) for a while…and you guys, I finally nailed it. In previous attempts, the brownies were always too dry, or didn’t look right, or weren’t fudgy enough (and fudgy is KEY). But THESE. These taste like a traditional brownie. I was impressed with myself when I took a bite of one for the first time and would be surprised to hear they were paleo and vegan if I hadn’t made them myself. They’re easy to make too – not too much fussing around with weird or random ingredients, and you can have them in the oven pretty dang quickly, too because they don’t take too much time to put together. Let’s chat about how to make these happen. We’re starting with some SUPER dark chocolate. I used Alter Eco’s Super Blackout Chocolate – it’s 90% cacao, and I’d recommend using something similarly dark or even unsweetened entirely. It’s melted down with some coconut oil and then mixed with maple syrup, coconut sugar, and a hefty dose of almond butter. The almond butter helps keep these incredibly rich, fudgy, and decadent. You can sub out your favorite nut butter here if you’d like – just make sure to use one that’s SIMPLE, no sugars or weird ingredients added. These use a flax egg to help bind everything, and a splash of vanilla extract for flavor. Almond flour, baking soda, and salt are added to the mix…and cacao powder to bump up the chocolate flavor even MORE! 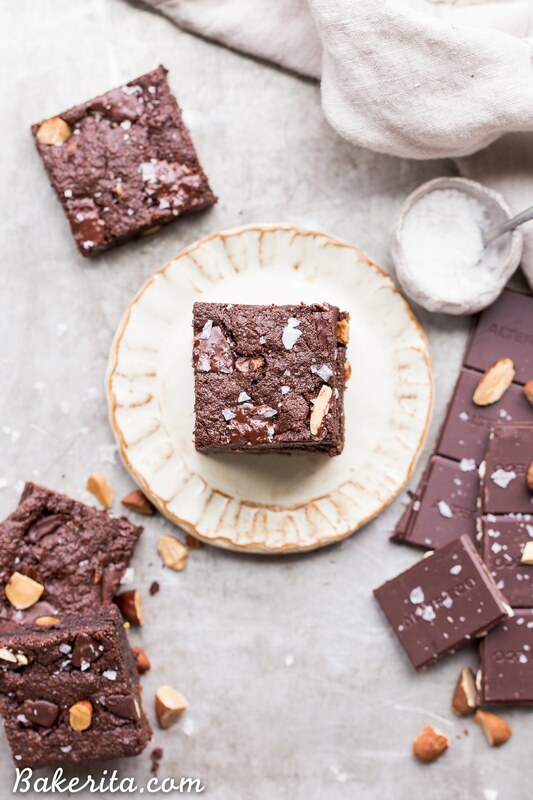 Once the batters all mixed up, we’ve got that THIRD dose of chocolate in the form of a chopped up Salted Almond Dark Chocolate Bar from Alter Eco…hellooooo lover. It’s so good – I could (and do ) eat this bar on the daily. Along with that, we’ve got crunchy roasted almonds which add the most irresistible toasty flavor. I hope you’ll give these a try and love them as much as I do! I’m nothing short of obsessed. Enjoy, my loves! 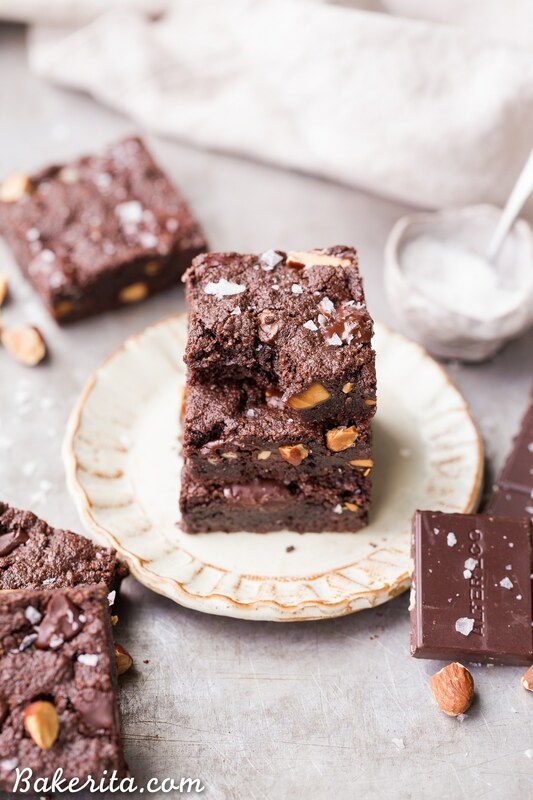 You'd never guess these super fudgy Salted Almond Brownies are gluten-free, paleo and vegan, because they taste just as good as a traditional brownie! 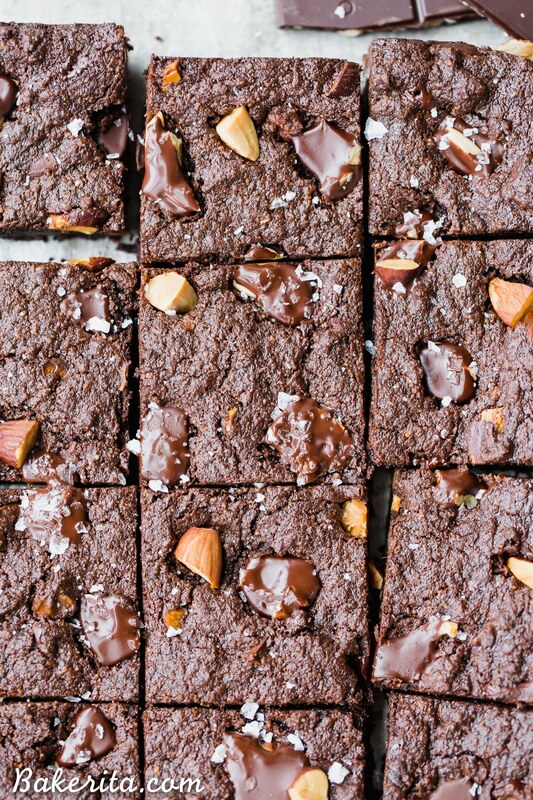 They're incredibly fudgy and chocolatey and the toasted almonds and sea salt make them even better. Put the Blackout Chocolate and coconut oil in a large glass bowl and microwave for 30 seconds. Stir, and repeat until the chocolate and coconut oil are completely melted and smooth. Add the maple syrup, coconut sugar, and almond butter. Whisk until completely combined. Add flax egg and vanilla extract to the chocolate mixture and whisk until combined. Add the almond flour, salt, and cocoa powder to the chocolate mixture and once it’s stirred in, fold in the Salted Almond chocolate chunks and toasted almonds. Bake in the preheated oven for 20-22 minutes, or until a few crumbs are attached when a toothpick is inserted into the center, but it’s not too wet. If desired, press more chocolate onto the top after baking! Sprinkle with flaky sea salt. Let cool completely before cutting and serving. I like to place them in the fridge overnight before cutting! Store in an airtight container at room temperature for a few days, or in the fridge for up to a week. Hi Jane, I would use one egg and one yolk for these. Enjoy! 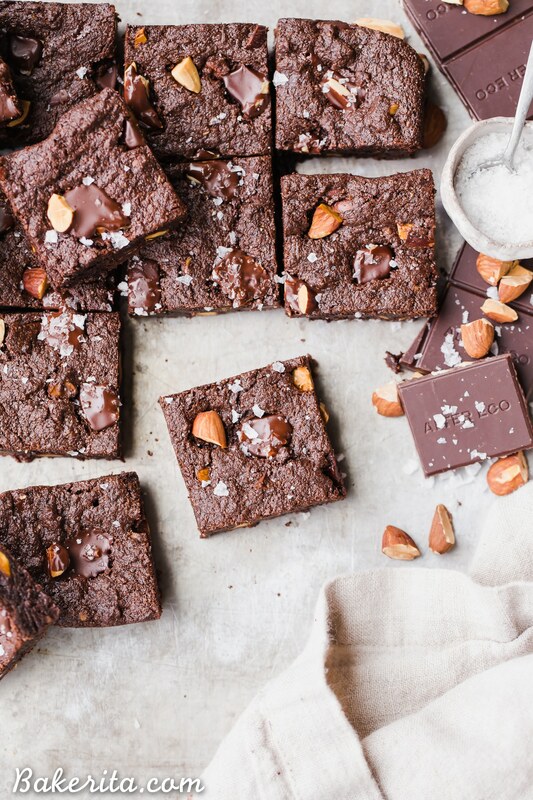 Gorgeous photos and these brownies look beyond delicious! Thank you so much Laura, I appreciate it! These look like the perfect brownie! I can’t believe they are Paleo, Vegan, and so simple!!! I’ve never heard of flax seed as an egg substitute before, does the flax seed swell? Hi Kylee, a flax egg, which is ground flax meal mixed with water, is a very common egg substitute! It gels up and creates a binding consistency, and when mixing it into a batter, like here, you’ll see the mixture pull together a bit the way you would with an egg. Hope this helps explain! I love her recipes!! this one did not dissapoint!! very good and turned out exactly as decribed! Amazing!! So glad you loved them Kayla. Thanks so much for your feedback!